Consumers will pay more to fuel their cars if the Trump administration moves forward with plans to roll back car fuel economy standards in place for the past six years, the region’s leading energy efficiency advocacy group warned today. The stakes are very high for all states in the region, said the Southwest Energy Efficiency Project (SWEEP). The Trump administration is expected to release a proposal this week to roll back vehicle fuel economy and emissions standards that have been in place since 2012. Acting Environmental Protection Agency (EPA) Administrator Andrew Wheeler and acting National Highway Traffic Safety Administration (NHTSA) Administrator Heidi King are expected to publish a joint rule to roll back the successful, money-saving federal standards. The current rules provide enormous benefits for consumers’ wallets and air quality. Already, these standards have saved consumers nationwide more than $55 billion on fuel costs cumulatively, but when fully phased in by 2030, the standards will save consumers more than $50 billion annually. At that time, the nation will save 23 billion gallons of gasoline every year, and reduce carbon pollution by 280 million tons a year. In Colorado, for example, an analysis conducted by the Environmental Defense Fund found that if the administration stops further increases in fuel economy, Colorado consumers will pay a few hundred dollars less to buy a new vehicles – but will have to spend up to $5,700 more on gasoline, for a net loss of $3,000 to 5,000 per vehicle by 2030. Drivers of pickup trucks will face an even bigger penalty, of up to $8,000 per vehicle in higher gasoline costs. The map (page 2) shows the total increase in gasoline use and projected gasoline costs by state by 2030. 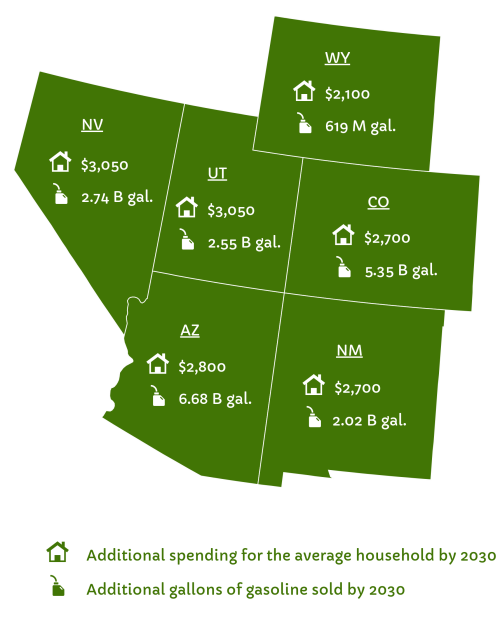 The increase in gasoline use ranges from 619 million gallons in Wyoming to 6.7 billion gallons in Arizona. Gasoline use in the region as a whole would increase by 20 billion gallons by 2030 if the standards are rolled back. Moreover, a typical household in the region would spend about $2,800 more to purchase gasoline by 2030 if the rollback goes forward.